Woo hoo, I’m doing sassy high kicks! Sephora is celebrating its Grand Opening at The Grove today. Yes, I actually do get excited for every one of their new stores… as with each Sephora comes a slightly different personalty that still maintains all the comfort of my favorite staple beauty products. And when I see those seven shiny black letters on a storefront outside my normal stomping grounds [insert angels singing here], it’s even more comforting. Judge if you want, but Sephora really does feel like the Mother Ship sometimes. Anyway, personal ramblings aside, The Grove location offers free (yes FREE!) beauty classes and has a special IQ Technology that helps you find your perfect foundation and lip shades. Also check out the back of the store for a new kind of skincare experience. Cough Lancer Skincare cough cough. Today, actress and entrepreneur Jessica Alba has opened Honest Beauty in a gorgeous pop-up shop at The Grove (189 The Grove Drive, PS-02, LA 90036). It’s right off the valet entrance, between the escalators and Sprinkles Cupcakes. The space features the color products, skincare and even art from local artists. Her makeup is versatile, user-friendly, and much better for your punim than the average makeup brand. Luminizing Powder – all 3 shades are beautiful! Head over to The Grove to work with one of the Honest artists and find your best shades. Or, hop online at honestbeauty.com. Oh! Another beauty suggestion… If you have to stand next to Jessica Alba on a humid 100-degree day, consider putting on some lipstick. Hanging out with the fam this weekend? This Saturday, The Grove will be even more fun than usual! 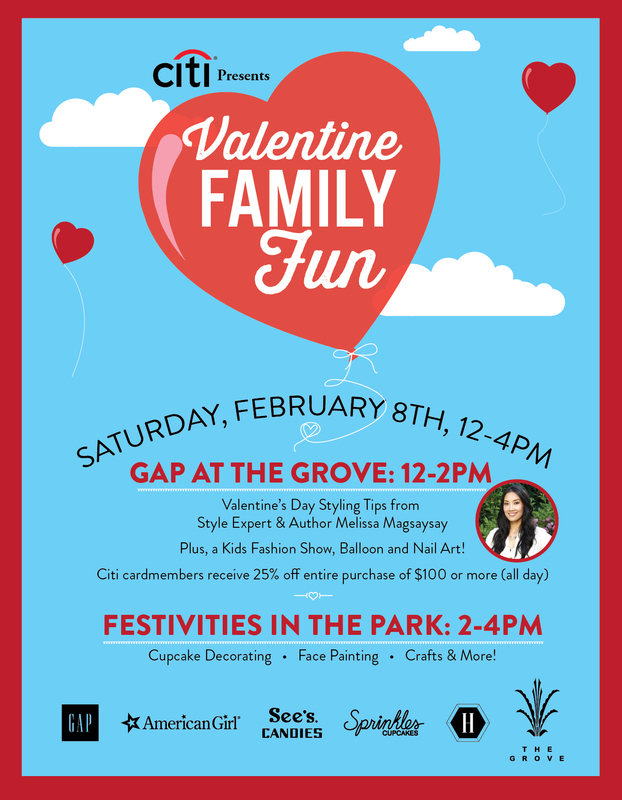 Grab the kiddos and stop by The Gap at noon for a fun Valentine’s Day event with local author & fashionista Melissa Magsaysay. There’ll be food, music, crafts, cupcake decorating, and of course no shortage of denim & tees. Then At 4pm, the party moves out into the park area. PLUS, it says See’s on the invite! I’m SO there.